Posted on Thu, Apr 19, 2012 : 5:59 a.m.
About 125 people packed the gymnasium of Liberty School in Saline to talk about oil and gas well drilling happening in Washtenaw County, as well as the pros and cons of hydraulic fracturing. An oil and gas company drilling in the Saline area says it can't promise it won't ever use the controversial technique known as "fracking" in Washtenaw County. "No, we can't (promise) that," said Greg Vadnais, the land manager in charge of mineral rights lease acquisition for Gaylord-based Paxton Resources. "We do have partners. We're bound by these partners to maintain a certain level of latitude." 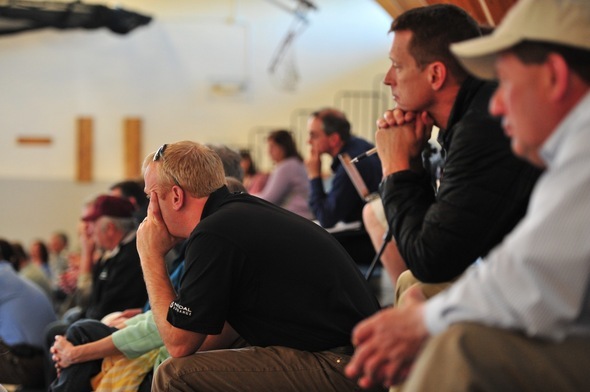 Vadnais and two other representatives of Paxton Resources attended a town hall forum attended by about 125 people Wednesday night in Saline. Relaying a question from the audience, moderator Lucy Ann Lance asked if Paxton would sign a binding legal document stating it would not frack in Washtenaw County. 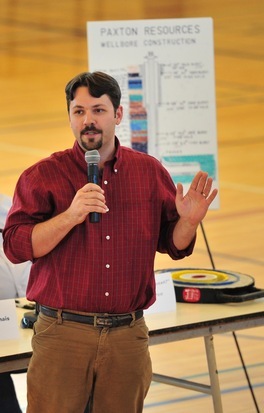 Greg Vadnais, land manager for Gaylord-based Paxton Resources, addresses the crowd during Wednesday's forum. He said the company isn't doing any fracking in Saline, but it operates a number of wells in northern Michigan where fracking has occurred. "There's nothing that restricts us from fracking. I'm not going to play around with that," he said. "But at some point we just have to come to an understanding that we're drilling oil wells here in Trenton limestone," he added. "We're not exploring for shale gas. We've got 4 trillion cubic feet of gas I think stored in Michigan right now and we're running out of places to put it." The fast-spreading technique called fracking, or hydraulic fracturing, is a procedure that drilling companies use to recover natural gas and oil from reserves deep below the earth's surface. It involves pumping a high-pressure mixture of water, sand and chemicals down a drilled well, which causes the surrounding rock to fracture, and then enables gas or oil to flow back. Fracking has become a political hot-button issue with state and federal officials discussing how to regulate the practice as environmentalists sound the alarm on its risks. The U.S. Environmental Protection Agency released new standards on Wednesday that include the first federal air rules for natural gas wells that are hydraulically fractured. The rules require operators to implement technologies by 2015 that the EPA says will not only reduce 95 percent of the harmful emissions from the wells that contribute to smog and health problems, but also enable companies to collect additional natural gas that can be sold. Wednesday's town hall meeting was organized by state Rep. Mark Ouimet, R-Scio Township, who said he wanted to bring together advocates on both sides of the issue. Mitch Rohde heads up the "No Paxton" protest group, which argues Paxton Resources has signed mineral rights leases with several area homeowners in Saline, Lodi and surrounding townships that allow the company to test, drill and extract oil, gas or any other minerals it might find "using methods that can destroy the local environment for profit." "The group No Paxton is not anti-oil," Rohde said. "It is more that we have concerns about what's going on in terms of our area and drilling in residential places. That is one of our main concerns. We don't necessarily want it in places where lots of people are living." 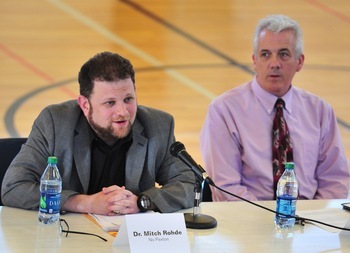 Rohde was one of six panelists who spoke at Wednesday's forum inside the gymnasium of Liberty School in Saline. Mitch Rohde, left, heads up the "No Paxton" protest group. He sat next to James Clift, policy director for the Michigan Environmental Council. He and James Clift, policy director for the Michigan Environmental Council, sat opposite from the three Paxton Resources representatives. In the middle was Hal Fitch of the Michigan Department of Environmental Quality, who defended fracking. Fitch said Michigan has a successful history of commercial drilling dating back to 1925 and fracking is a safe and proven process that's been going on since the 1950s. "We've had some 12,000 wells hydraulically fractured in Michigan and we've not had one incident of water contamination or environmental impacts associated directly with fracturing, and that's the case nationwide actually," Fitch said. "The administrator of the EPA has made that statement. There's no link to groundwater contamination directly from hydraulic fracturing." Fitch said the Michigan DEQ has a number of safeguards in place to prevent the kind of problems that opponents are concerned about. For starters, he said, the DEQ has stringent requirements for the construction of oil and gas wells. "We don't see problems in Michigan from contamination directly from a well bore," he said. "We see a few problems from surface spills, pipeline leaks, things like that." Fitch said the wells being drilled in the Saline area (by his count, Paxton Resources has been permitted to drill about four or five) do not involve fracking. "Will it ever be used in the vicinity?" Fitch said. "I can't say it never would, but not on this type of well." Clift said his group wants to see an orderly development of oil and gas resources in Michigan in a way that protects public health and the environment. "Let's face it, we're putting our resources at risk whenever we do these developments," he said. "These are not risk-free endeavors. There's always a chance that Michigan's water resources or our public health could be put in jeopardy by one of these operations." With half of Michigan's residents getting their drinking water from groundwater, he said, it's important to make sure freshwater aquifers are protected for generations to come. Ray Barnhart of Paxton Resources describes the drilling procedure. 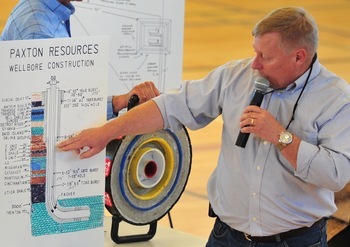 "This is just 2-inch sliver of a constructed well bore and this probably weighs 60 to 70 pounds, so it is very robust," he said of the circular object propped behind him. "That gives you an idea of what we mean when we talk about casing and cementing." and some of them really haven't been updated very much. To give an example, for 90 days the well driller doesn't have to give any information whatsoever to the state. There's kind of this secrecy period for the first 90 days." Fitch defended Michigan's regulations, saying the DEQ is doing a good job looking out for public health and the environment. He said the regulations have improved over time. "Since 1995, we've had a body of rules that requires secondary containment at surface facilities," he said. "You have to have heavy plastic liners under the tanks and the processing equipment. The pipelines that carry the product have to be pressure-tested and monitored." Fitch said the state also requires assessments of the impacts of water withdrawal, and any flowback that comes out of a well must be contained in steel tanks and hauled to a brine disposal well that's licensed by the state DEQ and U.S. EPA. He said that has to be at a location isolated from freshwater resources so it can't do any damage. Clift said the regulations could be better. "This whole idea that we're just going to kind of pump the waste waters and chemicals into the ground — kind of out of sight, out of mind — we think the regulation of those wells could be a little bit more rigorous," he said. "There's a lot of secrecy here," he added. "What chemicals are being used? What's being put into the ground? I think the public deserves to know." Rohde said the No Paxton group he heads up includes several concerned neighbors who have been meeting for about the past six months to discuss the issue. "I will admit that prior to a mineral rights lease showing up at my doorstep, I didn't do too much about it," he said. "I drive a big gas-guzzling truck, so I will put up front that I'm a NIMBY and I am a hypocrite in that way. I apologize for that." But he said he's thoroughly studied the issue and he's concerned about the potential contamination of water sources that local residents rely on for drinking. 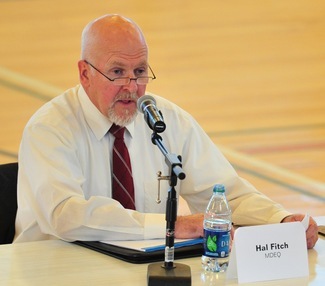 "We've had some 12,000 wells hydraulically fractured in Michigan and we've not had one incident of water contamination or environmental impacts associated directly with fracturing," said Hal Fitch of the DEQ. "We're concerned about hydrogen-sulfide gas emissions from these wells," he said, noting that can be toxic and deadly. "We're concerned about breathing it. We don't want it around our house. We don't want to be smelling it on a daily basis." Rohde pointed to a Dec. 24 incident in which an estimated 135,000 cubic feet of gas — mostly hydrogen sulfide — spewed from a well in Beaver Creek Township in northern Michigan. "I don't think people plan to have accidents, but they do happen when you're doing this kind of drilling," he said. "The Kalamazoo River (oil spill) certainly wasn't a planned accident. It just happened and they're still cleaning it up to this day two years later." Vadnais attempted to put into perspective the drilling Paxton Resources is doing in Saline. "We've only owned this project for about 15 months. We acquired this project, which is actually about six or seven years old," he said, adding a Pennsylvania-based oil company sold the project to Paxton Resources. "There has been oil and gas development in Saline taking place for about six years. There were three wells drilled in Saline prior to our ownership." Paxton Resources now has about 28,000 ares of leases in the area and about 25,000 of those were purchased from the previous company, Vadnais said. "We've taken maybe 3,000 more," he said, adding Paxton Resources has drilled only two new actual wells since taking over the project. "If we could move faster, I'm sure we'd like to do that," he said, pointing to the slowness of the DEQ's permitting process. "They don't necessarily fire these permits right back." Partway through Wednesday's forum, Vadnais said he listened to the concerns raised by the opposition and agreed with 99 percent of what was said. "We don't have a problem regulating this," he said. Vadnais said his company carries a $15 million insurance policy to make sure everything is covered in case of a catastrophic event. Fitch said it's usually the responsibility of the well operator to do the cleanup work if that becomes necessary. But he acknowledged there are some old wells in Michigan where the operators are either deceased or went bankrupt, and the Michigan Legislature has to appropriate $2 million a year to address issues with those. He said some of the older wells didn't have to meet today's standards. "Those are a little bit riskier," he said. "But the new wells like are being drilled here in the Saline area have to adhere to all of the modern standards. "The risks are pretty low with our current safeguards," he added. "It's pretty rare that we have a serious contamination problem with today's standards." Fitch said the drilling taking place in Saline is being done on 40-acre units, and they have to be at least 330 feet from the outside boundary, so there are protections for neighbors. The Washtenaw County Board of Commissioners is devoting tonight's working session to the issue of fracturing. The meeting takes place at 6 p.m. at 220 N. Main St.
Ouimet said there are just now starting to be serious discussions in Lansing about fracturing but he isn't taking a position at this point. "Where I am personally on it is I feel it's my responsibility to bring both sides together, so people can listen and learn as they go through the process," he said. Fri, Apr 5, 2013 : 1:52 p.m.
Fracking has been going on in Michigan for over 50 years. Without a SINGLE issue in Michigan. Please look up the facts about fracking in Michigan with the DEQ, DNR, and State of Michigan. You will see that they all have reports on the SUCCESS of fracking in Michigan. Im a green thumb myself, but Ive done the research. Fri, Apr 20, 2012 : 5:05 p.m.
Fri, Apr 20, 2012 : 11:19 a.m.
Well, I can see the anti-technology, anti-science zealots have hijacked this thread. The company cannot frack in Saline. The geology isn't right. But fracking has been a godsend for this country, and will permit us to to stay warm in winter and light our homes for generations to come. Obviously, standards have to be maintained, but to summarily dismiss this opportunity at going a long way towards real energy independence just shows a willingness to really harm people over an unfounded fear. Fri, Apr 20, 2012 : 2:55 a.m. This company needs to be told to go away quickly with its tail between its legs. The shills who support fracking should be outed as neighborhood persona non grata, if any of them are actually local. Thu, Apr 19, 2012 : 10:32 p.m.
Thu, Apr 19, 2012 : 8:55 p.m. Please view the slides provided by Dr Chris Grobbel who gave a presentation to a large number of Brooklyn residents coming to terms with the amount of development that has sprung up in the Irish Hills area. Take a look here: http://banmichiganfracking.org/?page_id=339 Dr Grobbel was a DEQ employee and was involved in hazardous material issues while there. Thu, Apr 19, 2012 : 7:27 p.m. Apparently greed knows no bounds...I can't say I wouldn't resort to drastic measures if some company swooped in and poisoned the water on my land. Michigan is such a beautiful state and fresh water is a precious, dwindling resource. WHO are these people who own these companies? Have they no shame or decency? What about responsible stewardship? Do you REALLY need another house/car/boat/fancy-doohickie? It's enough to make me sick. Thu, Apr 19, 2012 : 7:58 p.m. If you do your research, mostly Michigan residents. 65,000 oil and gas wells drilled in Michigan since 1900. Do you still like Michigan? Seen any oil wells? Thu, Apr 19, 2012 : 7:02 p.m.
His point about shale vs. limestone was overlooked. Sounds like the geology here isn't the kind where fracking makes sense. Thu, Apr 19, 2012 : 6:51 p.m. Relevant article, which will be voted down in the usual shoot the messenger fashion: http://www.nationalreview.com/articles/293086/truth-about-fracking-kevin-d-williamson If our heavy trucks were transitioned to natgas the resulting drop in oil consumption would get us to North American self-sufficiency in oil (including Canada). We need fracking to get us there. If renewable fuel sources ever get there, great, but natgas is ready now and buys us a big chunk of time. The economics work but the politics are problematic with the current regime. Thu, Apr 19, 2012 : 4:54 p.m. There are safe alternatives like terra slicing but you never hear about that do you, why frac when you can terra slice? Thu, Apr 19, 2012 : 3:53 p.m.
Fitch said there have been about two worker deaths in Michigan from hydrogen sulfide exposure, but those were cases where the workers were not exercising proper precautions. He said the DEQ has about 25 people out in the field that are conducting inspections of drilling and producing operations every day. &quot;I'm not going to apologize for some of the sins of our fathers. In the past, a lot of things were done out there that we really didn't know better,&quot; he said. &quot;But we've got a lot better handle on things now. Hydrogen sulfide — that's one of our primary concerns.&quot; Fitch said there are about 11,000 gas and 4,000 oil wells producing in Michigan, plus another 600 brine disposal wells and 2,700 gas storage wells. Thu, Apr 19, 2012 : 3 p.m.
And this from a community that protest windmill noise, so ironic. We cannot get the railroad to stop becuase of needed environmental studies and these companies walk in and promise jobs and leave big messes. Tar Sands anyone? Thu, Apr 19, 2012 : 3:30 p.m.
We already have Tar Sands in Michigan. Thats why the K-Zoo river clean up is still on two years later. But hey... we have been told xl pipeline and Tar Sands oil is safe, just like fracking. Thu, Apr 19, 2012 : 2:56 p.m.
Why is it that with all the fracking and all the new gas and oil they are finding in the USA and Canada that the prices keep going up ? The average joe is getting no benefit from this new discovery of oil and gas but in many cases is giving up the chance to drink clean water. Thu, Apr 19, 2012 : 10:35 p.m. The only way for oil prices to fall in the USA would be for the government to own the land- own the oil under it- own the oil refinery that refines it, and then sell it to the American people at a price that is cheaper than the world market. The world market dictates what oil is sold for. Opening up public lands to oil companies would do absolutely nothing to lower oil prices. There has been no oil shortage the last two years and look at the prices. Thu, Apr 19, 2012 : 9:31 p.m.
Prices of gasoline are going up because the only oil drilling in the USA is on private land, which is not enough. Open up government land and pipeline, and watch prices fall. Thu, Apr 19, 2012 : 5:46 p.m.
&gt;&gt; Why is it that with all the fracking and all the new gas and oil they are finding in the USA and Canada that the prices keep going up ? &lt;&lt; Are you confusing natural gas and gasoline? Natural gas prices (for home heating, cooking and industrial uses) are down from about $10.00 per MMcf a few years ago, to about $2.00 today, largely due to the success of fracking. (Fracking is less widespread and has less impact in producing oil.) The cost of gasoline for your car is up, because the price of petroleum is up, and that price is set internationally. The actions of the US, which produces about 2% of the world oil supply, have little effect on it. Natgas, not an international market, is more affected by the surge in supply brought on by fracking. Granted there have been some mishaps with fracking, but a tiny percentage. We don't stop all drilling for critical oil supplies because of the occasional mishaps -- we focus regulation more intensely and precisely to try to prevent the mishaps. That's what we should do, what the stated are doing, for critical natgas. We will probably need petroleum-based energy for decades yet, until solar, wind, etc can produce at scale. All the alt-energy sources together add up to, I believe, under 2% of energy demand. A huge increase in this is not yet in sight. Thu, Apr 19, 2012 : 2:38 p.m.
&quot;There's no link to groundwater contamination directly from hydraulic fracturing.&quot; This is exactly how I would expect someone who might profit from fracking would frame it. He's essentially saying, &quot;you can't 100% prove it&quot;. But if we are to be reasonable about it, we would need an independent agency to assess and weigh the probability of the potentially horrible long-term costs vs. the short-term benefits of having slightly cheaper gas. If you think you can believe one word that an oil&amp;gas man, or a republican controlled DEQ representative has to say, you are delusional. Fracking is currently destroying underground water sources (and surface waters) across this nation. This is all being done for a couple more years of happy motoring. This will all crash in 5 to 10 years and we will have nothing to show for it but dangerously polluted water. Great Lakes people please wake up before it is too late. Thu, Apr 19, 2012 : 7:54 p.m. Prove it. And then I will believe it. Thu, Apr 19, 2012 : 1:54 p.m.
Fracking is safely being applied all over the country. The depth of the process ensures that no ground water can possibly be contaminated and operators are being responsible. So far despite desperate attempts by extreme envrionmentalists to demonstrate contamination, there is little evidence of it happening - case in point all of Pennsylvania. &quot;Although thousands of wells have been fractured in Pennsylvania, DEP has not identified any instances where groundwater has been contaminated by hydraulic fracturing.&quot; We don't have a problem, so lay off. Of course maybe the agenda is to simply stop all development of the nation's oil and gas reserves so that the government can justify more control over the economy and promote electric cars that actually are less efficient and carry horrible chemical compounds and harmful elements. Maybe the agenda is to stop global warming despite the evidence that there is no loss of the earth's ice whatsoever. The minor loss in the arctic, is more than compensated by ice increase in antarctica. Therefore the effect is local to industrial development, like living in a city is warmer. Thu, Apr 19, 2012 : 3:01 p.m. It is true that in most cases fracking doesn't contaminate ground water, but the problems occur when the piping that goes through the ground to get to the fracking areas brakes thus contaminating rock/water layers close to the surface. Thu, Apr 19, 2012 : 2:58 p.m.
Good point dotdash! Seems people are mistaking the (still rather large) finger for the moon! Thu, Apr 19, 2012 : 2:32 p.m. Even if no ground water is ever contaminated, 100 billion gallons of water are being used to frack yearly in the US, and much of that will never become part of the ground water system again. http://www.earthworksaction.org/issues/detail/hydraulic_fracturing_101 Water is a shared natural resource and we all have a right to ask where it is going. Thu, Apr 19, 2012 : 2:14 p.m.
7 Pennsylvania towns have filed suit against HB1950 which is a law pre-empting local ordinances from maintaining their constitutional right to protect public natural resources. Also,fairly significant,The Pennsylvania DEP has revised the drilling permit ,requiring wastewater to be treated or recycled. It is good that people aren't just&quot;laying off&quot; as you suggest. Thu, Apr 19, 2012 : 1:22 p.m.
Can we please put the &quot;GREEDY LANDOWNERS&quot; who sold the mineral rights to the oil companies who are trying to end America's dependence on foreign oil in JAIL! If it wasn't for them, we would not have this problem. I just love all the emotion over Fracking, it reminds me of how we were going to save the &quot;Rain Forest&quot; my using plastic grocery bags, now of course we are back to paper bags or bring your own &quot;dirty grocery&quot; bags. Thu, Apr 19, 2012 : 12:49 p.m.
We as a country need to become energy independent. Wars over oil hurt us oil. Responsible exploration is the key. We've had the automobile for over 100 years, and nothing has worked as well as gasoline, despite over 100 years of experimentation and research. If safeguards are in place, we need to proceed with what works. Thu, Apr 19, 2012 : 6:09 p.m.
Thu, Apr 19, 2012 : 12:45 p.m.
My understanding is that the geology of this area does indicate fracking as a real potential. Deep toxic waste Class II injection wells (http://water.epa.gov/type/groundwater/uic/class2/) already permitted for Irish Hills where oil wells are going in at a rate of knots. These are the wells which caused earthquakes in OH. Washtenaw County is on a fault line. Oil well in Hillsdale was illegally fracked 2 years ago without DEQ knowledge or oversight. Landowners can be compulsorily included in a drill site, against their will. If no oil is found, dry wells can be used for toxic waste. Power to regulate development has been removed from local and county government. DEQ is underfunded and incapable of staying on top of things with 38 inspectors in the entire state and &gt; 56,000 permits issued. Who exactly is looking after us? What could go wrong with fracking? Just ask Gelman Sciences how well they did avoiding ground water contamination. Thu, Apr 19, 2012 : 12:28 p.m.
Dear Paxton &amp; DEQ. Don't frack with our water. Thu, Apr 19, 2012 : 12:25 p.m. The potential downside of fracking impacts everyone. These processes use and contaminate millions of gallons of water and inject huge amounts of carcinogens into the ground (which the oil companies will not identify). We need some oversight because in the context of large amounts of money, private companies do not always act in the public good. Thu, Apr 19, 2012 : 12:20 p.m.
Those cylons are going to frack everything up! Thu, Apr 19, 2012 : 6:01 p.m. Personally, I was shocked to see such language used on the site! Thu, Apr 19, 2012 : 11:35 a.m.
Everyone needs to watch Josh Fox's GASLAND - and soon. And then get all over this issue. It's quite serious and scary. Fri, Apr 20, 2012 : 2:56 a.m.
Just so people are aware of the facts: the flaming water taps in Gasland were flammable well before any drilling of any kind was done in the area! That is a proven fact-they were the result of cracked water well casings and natural methane deposits. Those flaming faucets were simply included to mislead the viewer . . and it apparently worked. Gasland is a work of fiction disguised as fact . . .Michael Moore would be proud. Thu, Apr 19, 2012 : 7:52 p.m.
And then check out the facts on GASLAND. I've heard that his documentary has some serious flaws. Anything for attention and notoriety. Thu, Apr 19, 2012 : 6:08 p.m.
Thu, Apr 19, 2012 : 11:44 a.m. I second this statement. Educate yourself on the matter. Thu, Apr 19, 2012 : 11:25 a.m. There were way more than a 125 in the audience, not sure how the count was derived? The sign up sheets? I'm not a s concerned as what is taken out of the ground as what is going into the wells. The State of Michigan DEQ rep indicated they aren't even sure of what chemicals are used. The Federal governement allow Oil companies to keep the contents of the brine solution confidential because of &quot;trade secrets&quot;. Try testing for contamination when you have no idea what to look for in the water. Thu, Apr 19, 2012 : 11:16 a.m.
Something strange going on here. Michigan Department of Environmental Quality - DEQ has a vast interest to get more permits/money for drilling and continue its existence than working for the people of Michigan and the environment. Funny that he said &quot;since 1995, we've..&quot; do you know why he started with that date? That is because DEQ destroyed the records prior to 1995.. I wonder why? Thu, Apr 19, 2012 : 10:53 a.m.
don't see any mention of the depth. My impression as to why they can state a previous history with minimal problems is the older drilling did not go as deep as they intend to now and into the future. The newer deeper drilling has significantly greater risks. Thu, Apr 19, 2012 : 10:06 a.m.
Saline is going to lead the way to help destroy our environment? No fracking!